Hi Everyone... 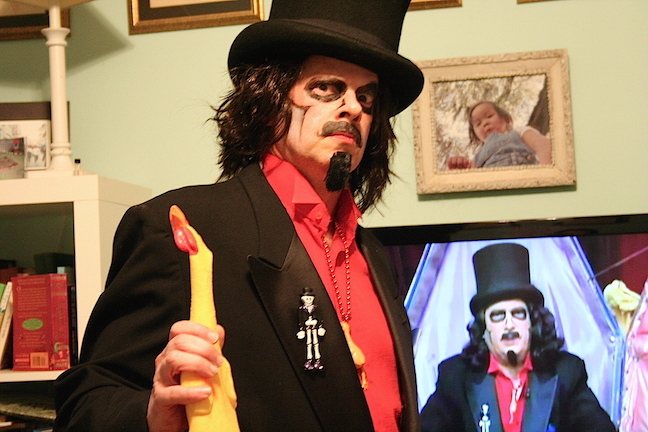 I'm Edward a.k.a "Fan of Svengoolie"! 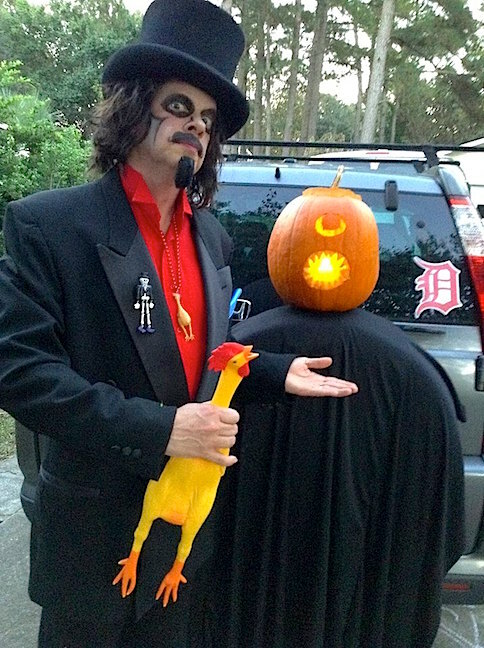 I have been watching Svengoolie on Me-TV every weekend for the past 2 years so I'm a newbie fan I guess you could say but have done lots of research and watched youtube videos to learn the history of our favorite Horror Host so I think I'm pretty well caught up and up to speed. 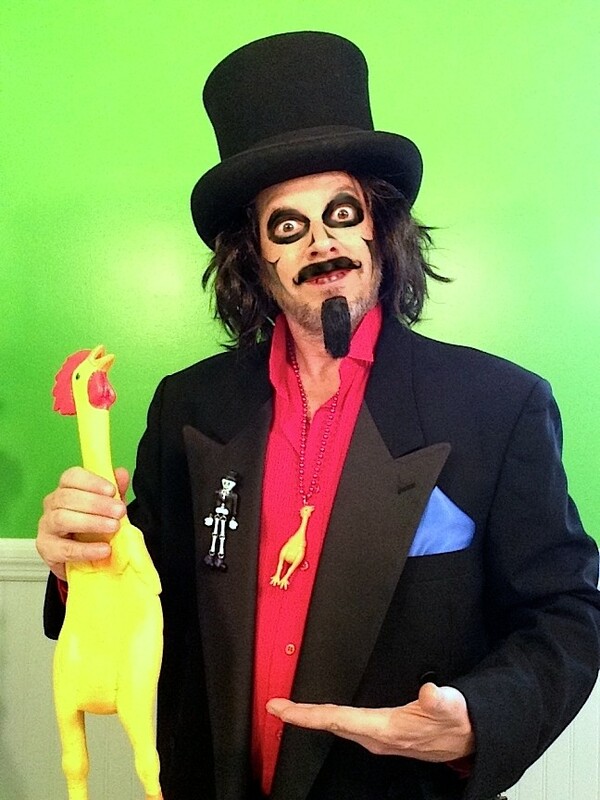 So a bit about me; I'm a 47 year old kid, I mean, father of two and grew up watching a horror host show called Monster Movie Matinee in upstate NY showing old monster movies and have been getting back into old horror films these past few years and am thrilled to have discovered Svengoolie! Here are some pics and I hope to be able to contribute more... Thanks for allowing me to join in! Welcome! And how did you locate that skeleton pin??? That's a terrific find! BlueCat wrote: Welcome! And how did you locate that skeleton pin??? That's a terrific find! I got super lucky actually... ebay. I had been scouring the web for months looking in ebay, Etsy and a couple of Hallmark collector forums only to find 2 images of this thing long since sold... well, on Sep-01 (just last week!) instead of typing in Hallmark skeleton lapel pin (and other variations on that) I just typed in Svengoolie to look at the collectibles posted and there it was! But, the person knew exactly what it was and who would want it as it was listed as SVENGOOLIE SKELETON LAPEL PIN and set at a Buy It Now for a premium if not excessively marked up price of $129.99!!!! OMG! I love Sven, but that's a little "rich" (get it??) for my blood! Glad you got it though! BlueCat wrote: OMG! I love Sven, but that's a little "rich" (get it??) for my blood! Glad you got it though! LOL! I see what you did there! All in all the entire costume cost me about $300 but Just wait till I post my next "Sven" project! Wow, that is impressive! Especially the pin- I have been looking for one (I collect Hallmark), and simply have not seen one at any price! Well done! Tygercat wrote: Wow, that is impressive! Especially the pin- I have been looking for one (I collect Hallmark), and simply have not seen one at any price! Well done! Thanks Tygercat! 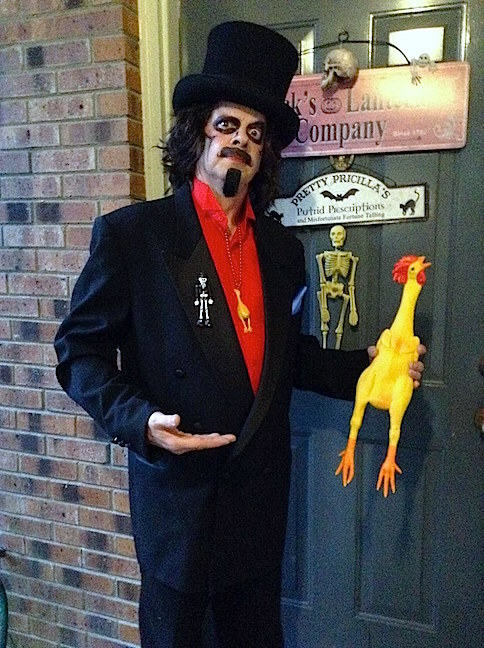 I got a little obsessed with getting as close to accurate stuff as possible but just didn't want to do a half baked Svengoolie suit with just anything. I got so lucky on the pin... one just happened to come up on ebay a couple of weeks ago but I paid a hefty price for it! You would think these would be easy to find... sadly now that I've set a record value for one, a few more might come up on ebay soon. I bet there are tons of them out there stashed away and forgotten in closets, attics and cellars. I'll keep an eye on ebay and post if I see any more come up. Fan of Svengoolie- I would not be surprised if some of those pins suddenly come out of nowhere on Ebay. Hallmark pins are not as widely collected as the ornaments, and I have never even seen a list or catalog of them. Most of my Hallmark pins are Christmas releases, and they can also be hard to find. 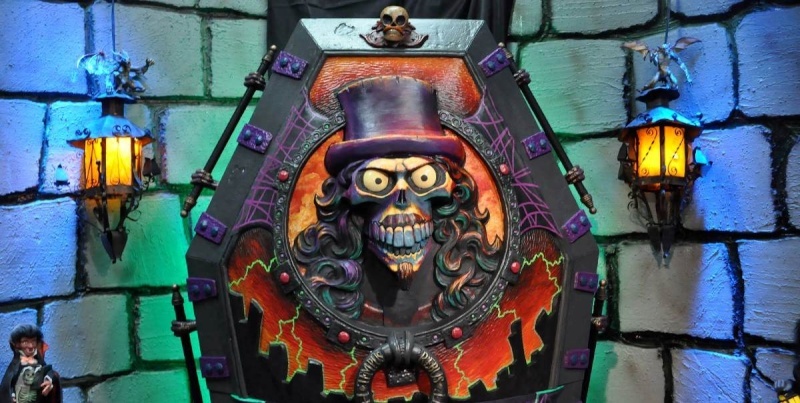 I just stopped by our local Halloween store, and found a not-bad black top hat- not a really good one, like yours or Sven's, but certainly adequate. I tried it on- and the thing went down all the way to my nose. Way too big. I undoubtedly looked ridiculous, but that was not the kind of silly I was trying for (not to mention the fact that I enjoy being able to see where I am going). The hunt continues. Also couldn't find a single rubber chicken, not one- what kind of a Halloween store is this, anyway??? Tygercat wrote: Fan of Svengoolie- I would not be surprised if some of those pins suddenly come out of nowhere on Ebay. Hallmark pins are not as widely collected as the ornaments, and I have never even seen a list or catalog of them. Most of my Hallmark pins are Christmas releases, and they can also be hard to find. Not bad! The wig is, indeed, problematic- I believe I recall Sven saying he got his original wig from KMart (!) back in the 80s, but they no longer sell wigs. I saw some at Spirit Halloween store that might possibly work- not sure of the price, though. Main issues are some curls, and color- Sven's wig is actually dark brown, although it looks black on TV. If you have been watching the recent showings of him walking around a comic convention, with the camera practically on the back of his neck, you can see the color of the wig. Lighting can do funny things to hair color, my own hair is very long and the color comes out different in photos depending on where the shot was taken- outdoors, it's lt brown, indoors, it can be almost blonde under photo lights. Let's not talk about my drivers license . mine is actually dark brown as well but the photo is just not lit right, just taken with my iPhone ... the color is about right but its a cheap halloween store wig and you can't set a curl in synthetic hair... I even tried to with extra hold hair spray and curlers but it didn't take and a real curling iron will melt the hair. I did try using a hot hair dryer to set it but that too failed. I guess they are as they are manufactured. Sven's wig is a Jacqueline Smith model! I laughed out loud when he mentioned that! LOL!!!! That is hilarious BC! That actually might help put me in the right direction for a more accurate version! interesting... I'm willing to give the boiling water treatment a try but I'll wait until after Halloween so I'm not panic buying a new wig! alright.. Halloween has come and gone.. as I suspected only 1 person knew who I was! I had a rough day at work and due to traffic got home late with only 15 minutes to put makeup on and get suited up so I didn't get to spend as much quality time with the makeup as I would have liked.. but its fine for this go 'round. next year I hope to have a better wig as well. Fan, that's a very credible job! Well done ! I think that it is funny that people routinely describe Sven's coiffure as a "fright wig" when it was originally worn by a very beautiful woman. The closest thing I saw this year to it was something described as "shock jock wig", which looked sort of like Howard Stein's hair. My own Halloween efforts were very modest- I wore my cat ears to work (with a black turtleneck and pants, and a jacket in case I suddenly had to look respectable). I was very pleased to find cat ears this year that actually were sized for adults, and bought several pairs. Most ear headbands are sized for kids, and will give me a headache after about 30 minutes; I wore these all day and actually forgot I had them on at one point. So that was a success.